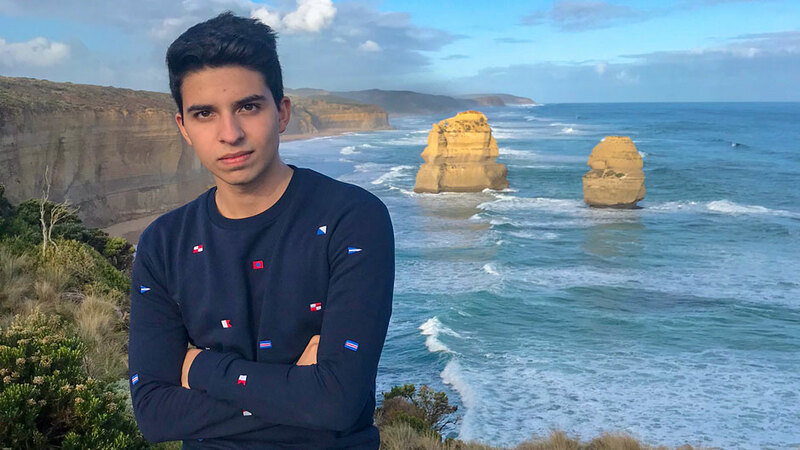 Nursing student Antonio Sanchez found his passion for research while on a training program in Australia, where he visited the Twelve Apostles rock formations off the southeastern coast. 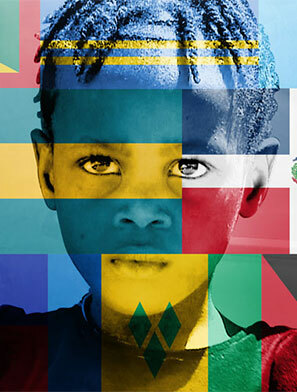 The School of Nursing and Health Studies’ global research training program for minority students is helping diversify the health sciences workforce. Heading to Canberra Airport in Australia’s capital after a tedious day trip analyzing stroke data with a statistician, Antonio Sanchez was amazed by the site from his taxicab window. A huge mob of kangaroos was bounding across an open field and onto the road. “It was one of the most memorable and exciting moments of my two months in Australia,” recalled Sanchez, who was among 11 nursing and public health students the School of Nursing and Health Studies (SONHS) dispatched around the world this past summer for its fourth Minority Health International Research Training Program, or MHIRT, funded by the NIH’s National Institute on Minority Health and Health Disparities. But the eight weeks Sanchez spent at Australian Catholic University (ACU) in Sydney under the mentorship of a renowned stroke researcher also opened an exciting, new path to his future. Sanchez, who will graduate this May with a bachelor of science in nursing, returned to Miami committed to pursuing an advanced degree and a nursing career that encompasses both clinical care and health sciences research, the very interest that MHIRT was designed to foster among minority students. 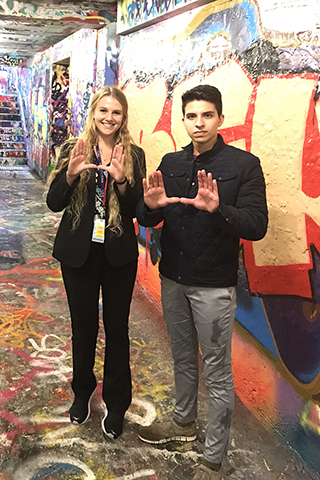 Now approaching its fifth and final year of the $1 million-plus NIH grant, UM’s MHIRT program aims to encourage and equip promising undergraduate minority students like Sanchez to pursue careers in health disparities research by providing them research training experiences abroad. 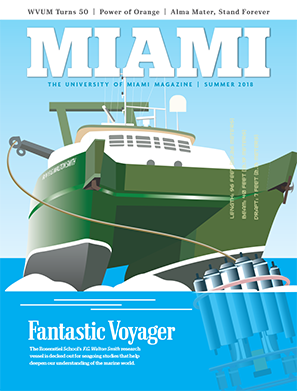 Since the program’s inception at the University of Miami, 41 MHIRT scholars have spent eight weeks in Australia, Spain, Chile, Jamaica, or the Dominican Republic, paired with UM and international mentors from institutions with which SONHS has previously collaborated. The final 10 MHIRT undergraduates were recently selected and will leave for their host countries in June. A handful of previous MHIRT scholars have gone on to pursue doctorate or master’s degrees, which Johis Ortega, associate dean for hemispheric and global initiatives and co-principal investigator of the MHIRT program, said is a small but important step in meeting the national mandate to build a culturally competent scientific workforce and end the health disparities that plague socially, economically, and environmentally disadvantaged people not only around the world, but across the U.S.
Antonio Sanchez and Sabrina Smith visit the sites of Sydney, where they spent two months on nursing research at Australian Catholic University. Sanchez and fellow nursing student Sabrina Smith got an in-depth look at how essential nurses are to improving care this past summer while working with a research team led by ACU nursing professor Sandy Middleton on an offshoot to her landmark stroke study. Published in The Lancet in 2011, the Quality in Acute Stroke Care (QASC) study showed that the protocols nurses initiated to manage three common post-stroke complications—fever, high blood pressure, and swallowing dysfunction—resulted in a 16 percent decrease in death and disability among patients who suffered a stroke. The protocols have since been adopted in stroke units across New South Wales, Australia’s largest state, and are being introduced in 300 hospitals in 12 European countries. For Sanchez, the real-world application of QASC and the follow-up study he worked on during his summer in Sydney, which centered on the efficacy of spouses and family members who cared for QASC patients after they left the hospital, reaffirmed his initial impression of nursing. He formed that in high school, when he began volunteering in the emergency room of Miami’s Mercy Hospital. “That’s where I realized nurses are on the frontlines of health care and had the highest impact on health care,” he said. But his experience in Australia also made him realize that actually gathering or analyzing the evidence that guides evidence-based medicine would make him a better clinician. 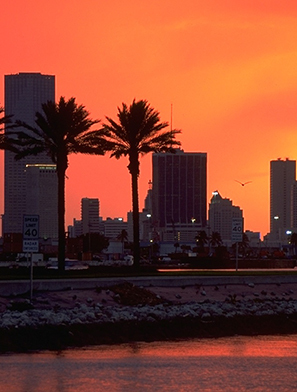 That’s what compelled him, when he returned to Miami, to become a research assistant on Dean Cindy Munro’s Family Automated Voice Reorientation study. Known as FAVoR, the $1.9 million NIH-funded study is exploring whether scripted audio messages recorded by family members can help prevent delirium in critically ill ICU patients by orienting them to the chaotic ICU environment. It’s also why Sanchez, who already has applied to the nursing school’s graduate program for a master of science in nursing, is excited about the next benefit of the MHIRT program, which began with a three-week orientation with SONHS mentors before scholars headed to their host countries, and concluded with a weeklong seminar focused, in part, on disseminating their research. He was among six MHIRT scholars chosen to submit their research posters for presentation at the Nursing Consortium of South Florida’s April 26 conference on leadership. Other students in Sanchez’s MHIRT class contributed to a number of other studies, from an investigation of issues impacting nursing students in Chile to factors that contribute to medication and treatment adherence among adult asthma sufferers in Jamaica to the effects ofsocial support on pregnancy outcomes in the Dominican Republic.